KODI IP driver for NEEO. 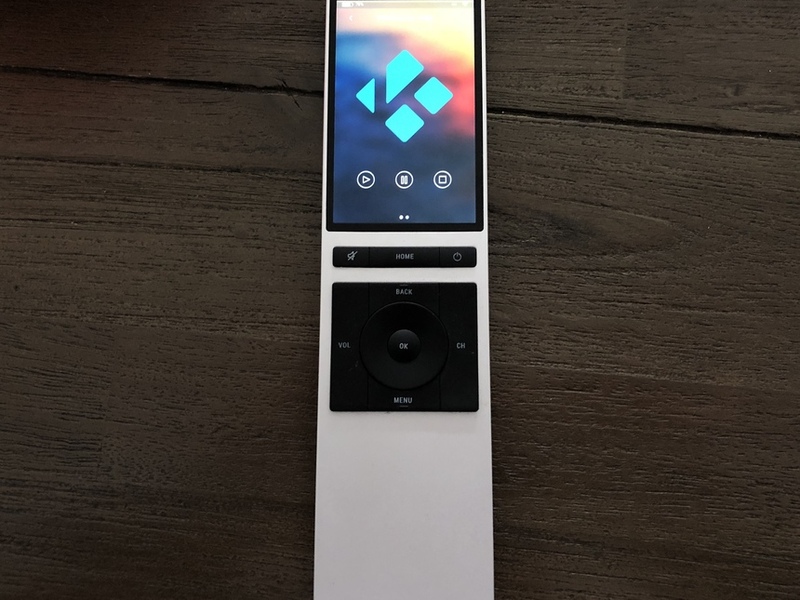 This will be a full featured kodi driver for NEEO. This driver is in an early beta stage so expect issue. I kindly request to only report crashes including crashlogs, Features will come later. Remove the device you are using from NEEO before using this new version. I still make a lot of changes with every version to find the sweet spot. Wake on Lan as POWER ON command. Browse through movies and recent Movies. (add the Movie Library as shortcut). Browse through TV Shows and recent episodes. 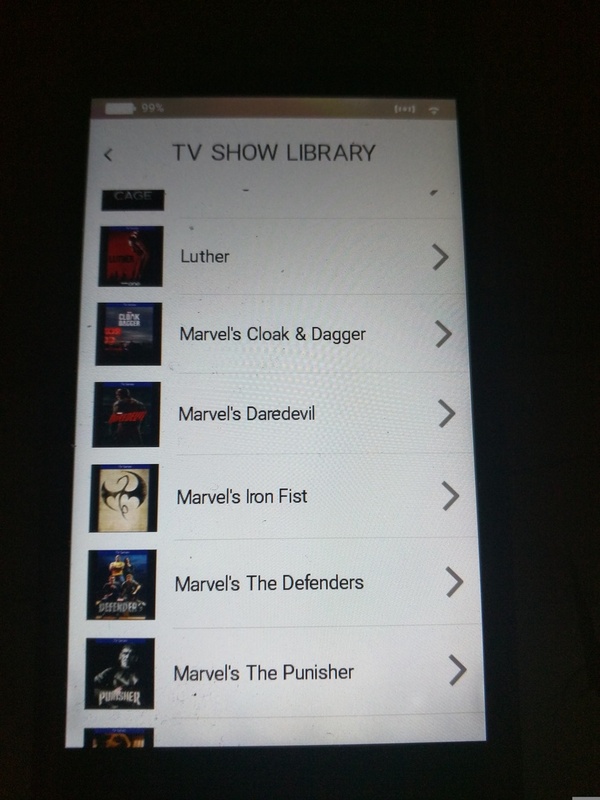 (add the TV Shows Library as shortcut). Browse through PVR TV Stations and Radio Stations. (add the PVR Library as shortcut). Browse through Music Albums, recent Albums and Music Video's. (add the Music Library as shortcut). Large Now playing cover image. (add the <Now Playing Cover (large)> Image as shortcut). Small Now playing cover image. (add the <Now Playing Cover (Small)> Image as shortcut). Now playing label. (add the Label as shortcut). Volume Slider. (add the Slider as shortcut). When EPG is available the broadcasted title is shown on TV Channels. All known API commands are exposed as buttons. Button to update Audio Library. Button to update Video Library. Kodi password must be set to nothing or to "kodi". Username/Password is not being handled. Kodi 17.x on Android is not supported because it lacks Zeroconf, alternatives are using KODI 18 or use LibreElec. The "kodi Player" driver is NOT complete. use it for fun or show of but please Don't add bug reports for that. It's mainly unusable at this point. 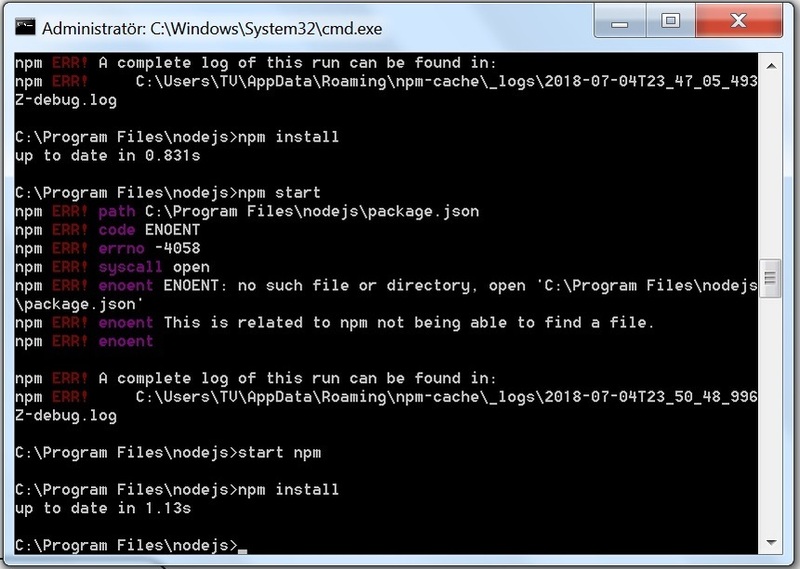 You will need a copy of Node.js (v6) installed, see http://nodejs.org On windows you need either Bonjour SDK or iTunes installed for MDNS discovery. Download or clone the github files to a directory of your choosing. Extract the files. 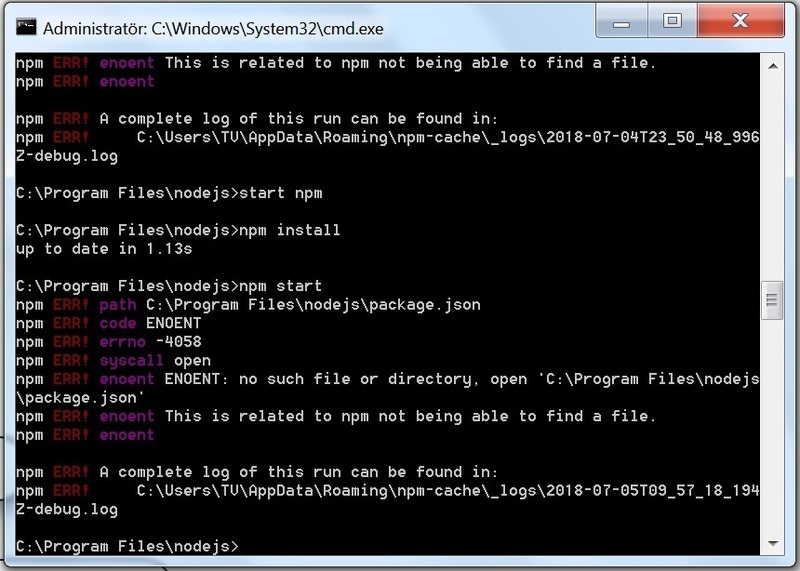 Use your computers console and go to the path where the files are extracted and Install the package using NPM. Use your computers console and go to the path where the files are extracted, Start the driver with NPM. Running the driver the old way or for debugging. 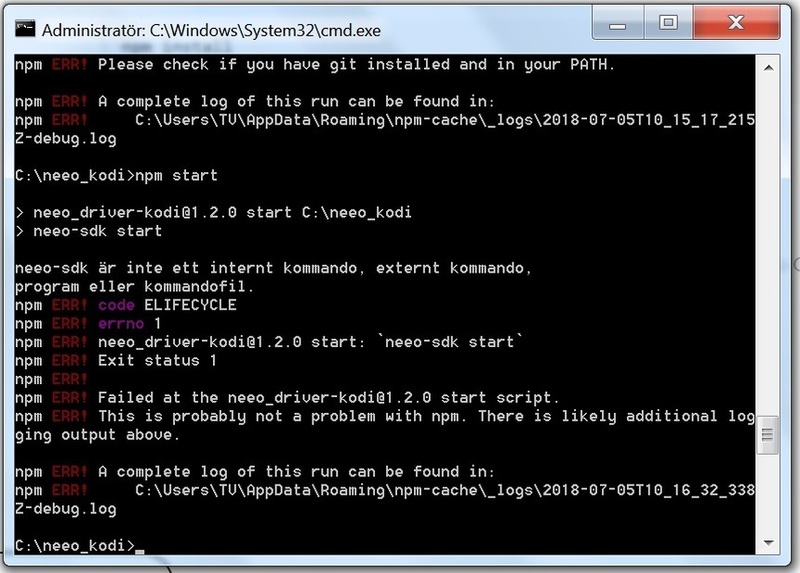 Use your computers console and go to the path where the files are extracted, Edit the file Debug_NEEO_DRIVER-KODI.js to your pesonal setup, then Start the Debug_NEEO_DRIVER-KODI.js file with node. "Allow remote control from applications on other systems". set Kodi User/Password to either kodi/kodi or leave the password blank (default). NEEO - Official NEEO website. Planet NEEO - Official NEEO community website. KODI - Official KODI website. NEEO-SDK - NEEO SDK github. NEEO-SDK Docs - Detailed SDK documentation. Fixed issue not showing cover art when other kodi webservice is used. Fixed showing listitems x times. Devices need to be re-added. sorry. Fixed list error when kodi didn't report any items. Added generic Library Directory while still having the generic Movies, Music, etc.. Fixed content aware controls being dependant on english language. Added disconnected message to listview. Added SUBTITLE and AUDIO (Language) Buttons. Fixed lists limited to 64 items. Added PLAY PAUSE button for handeling play pause in Player, is mapped to OK button. Reconnect when connection is lost. Removed Module node-arp, Using native Kodi RPC call. Removed Module node-kodi, Using purpose build websocket connector. Improved discovery time from 8 Seconds to 3. Bugfix: Recent movies returns actual count to list. Bugfix: list limit could exceed item count. Bugfix: Empty list were cousing an issue. Converted all connection methods to use websocket. Added now playing image, Small. Added now playing image, Large. Reworked the way itemlists are build. now steps of 64 items are fetched. As all basic features are now working i've updated to 1.1.0. Added PVR TV stations. Shows a list of TV channels and if EPG info is availeble also the current broadcast title. Added PVR Radio stations. Shows a list of Radio channels and if EPG info is availeble also the current broadcast title. Added contentaware buttons of Channel UP and Channel Down. Added support fot Music albums and tracks. Added support for Music Videos. added movie filters: All, Watched, Unwatched. added genre to movie list. just to play around, might change. Changed code to use NEEO CLI, Remove old files first! Changed the way to obtain the MAC address. Added content aware controlls. i.e. using cursor in movie to skip. Added Discovery logging to troubleshoot. Fixed "ENTER" -> "CURSOR ENTER"
Added Connection banner in KODI. Automatically connect to KODI instance when POWER ON command is send. (maximum boot duration supported is 5 Minutes). Manual connect to KODI instance when any command is send. (Command is not queued except for Power ON and Power Off). Added timer configuration in KODI Controller. Christian thanks, I have no idea what happened but now it works again. Nice, that looks well done. Is the adddirectory part of the unreleased sdk? I have wanted to build a pandora player through Pi (instead of buying a new sonos system) but assumed directories were not possible yet. Aaron Ranson normally I can’t speak about new beta features as I don’t know if or when they will be released to the public firmware. Anyway in one of the next firmware versions the directory feature will make its appearance (could be soon could be later). It needs a firmware upgrade and the upcoming SDK. I’m looking forward to see what you can come up with. Was the driver installed on the brain or on the Pi? Christian it’s running on my development PC. This looks amazing. Good job Niels de Klerk ! Is this working on the update released yesterday? Rolf Blidborg yes, feel free to play with it but do understand it’s still being in development. Actually I’m coding right now. So if all goes well I’ll have an update tonight or tomorrow. Niels de Klerk it looks great! What are chances to see it released with one of upcoming firmware releases? Quite many users are not ready to play with SDK, thus inclusion into firmware release would be more than welcome. Thanks for doing this! Arunas M I don’t think that will happen anytime soon. I still have a lot of work to do but I’ll definitely will ask NEEO if they want to include it at some point. The attention this driver has created could potentially help reaching that goal a bit faster but for now it depends on me finishing the driver. also good to know is that NEEO is working on making the SDK more accessible to all users. This will need some time to but the start is made. as another side note Chris Shepherd is working on a driver manager. This is a web based UI that makes installing these drivers very easy. I have just published version 1.1.0. Have fun. Yes, I have been checking on it for while now. If you find some spare time otherwise thanks for the good work done. Emmanuel Serebe are you using the main or the next branch? I’m currently working to get the next branch ready, goal is to have actual now playing information including album art/movie poster. I used the link you posted. Am not aware of the next branch ===> I would like know more. One more thing though I have been using /etc/rc.local to run the other KODI driver on boot with : su pi -c 'node /home/pi/node_modules/neeo-driver-kodi/src/index.js < /dev/null &' The question is, what is the file that runs this driver? Emmanuel Serebe I’m interested in how CEC has influence on this driver. Keep me posted if you find out how that could be. If the code doesn’t reconnect then that looks like a crash has happened an I would like to know more about that to. the next branch is sort of my work in progress, this might work but probably doesn’t. I’m changing from http URI encoded RPC commands to web socket RPC. This way I get notifications back from kodi to the driver. I can than use these to display kodi information on the remote. most of that is still a work in progress. tomorrow I will receive my new kodi box. I’m now using a HTPC but because it lacks HEVC support I have chosen to buy a Amlogic S912 box. I’m hoping to run LibreELEC on there and include the driver in the build. At least if I can manage to do that. First edit it as my defaults are set. I included a debug file down below from the previous crash. For kodi box I opted for the MINIX Neo N42C-4 Mini-PC. It's up gradable without losing your Windows licence by simply turning off booting from eMMC in the bios. So I installed Kodi on an M.2 in a slot provided. Otherwise am looking forward to your project with LibreELEC. It's said that LibreELEC has a Docker plugin but I have not tried it yet but wouldn't mind to take it for a spin. Emmanuel Serebe I am using a intel NUC6. It does 4K but no HEVC or HDR. I’ve ordered the minix U9. docker on LibreELEC is very interesting! When I made some progress with the driver I’m going to look in to that. Looks like I could potentially offer the driver installation through the kodi interface. That would be awesome! But later trying to get hold of the WeTek Play 2 but can't find one. It seems more advanced with a built in TV Tuner and readily supported kodi builds here : https://openelec.tv/downloads . That's why I went for the MINIX Neo N42C-4 Mini-PC. It behaves like bare metal so you can do much you like to it. Emmanuel Serebe It's so hard to get a decent 'do it all' box. either it can't sync to refresh rate, or doesn't support HDR or HEVC or .... or ..... it's crazy. I have no issues with booting from a thumb drive as long as all is supported. let's see. Niels de Klerk I just installed LibreELEC (It doesn't have CEC settings) and put the CEC module back in because the TV was not powering ON/OFF because of the way the BRAIN issues coimmands if a device is already been added (The set up includes a satellite TV tuner which also has CEC) . And now no crashes fingers crossed! Emmanuel Serebe just got my minix neo u9-h and placed LibreELEC on a USB disk. It works like i hoped it would. first tried the stock Android build but Kodi on Android is just rubbish. So directly after installed LE. 4K HEVC HDR Dolby Atmos playback went smooth. Refresh rate adjusted nicely to the movie so I’m very happy. Niels de Klerk Cool! what do you think would an external USB disk be the effect in case you have to run Docker containers? Or what is the robustness of an eMMC or M.2 ssd as compared to a USB thumb drive? They do make USB kits you can plug them in. And the minix neo u9-h does CEC but what I wouldn't know if it's system wide or only works with the built in kodi. You could be able test the effects on the driver. Emmanuel Serebe for Docker I don’t need more disc performance but for kodi I need to do better. I’ve used a crappy old cheap USB disk now, just to do some testing. I’ll buy a ultra fast microSD card later today for this setup. Niels de Klerk Does this affect the previous set up and if so what's the update process ? Or else how to check the version because just deleted the old project and rerun git clone? Emmanuel Serebe best is to newly install the driver. There are so many changes that you also will need to remove and add the kodi device I’m afraid. Niels de Klerk Perfect Timing, need something to to tomorrow night! ;-) need to stay awake longer due to following nightshift. So will fore sure Update and Test the Driver! 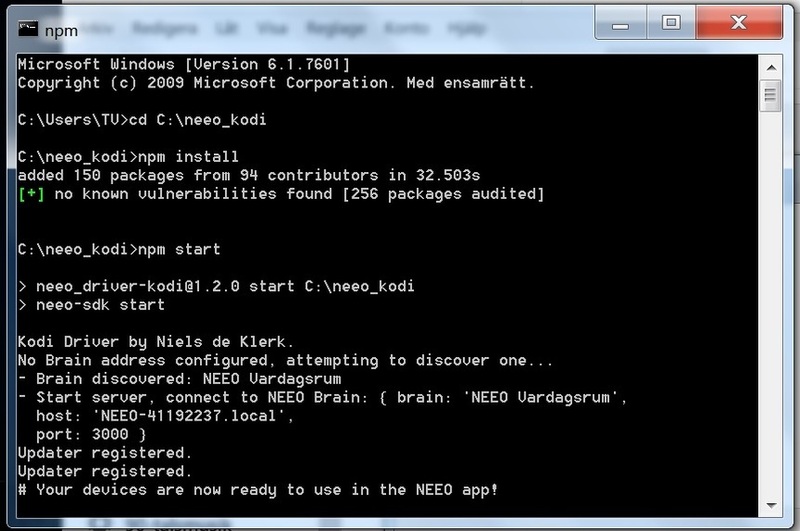 Niels de Klerk What happens when you leave the BRAINS ip blunk in the Debug_NEEO_DRIVER-KODI.js ? Can it be auto discovered? Markus Mahr Exactly! But as I run the driver using rc.local, I think the service is running! 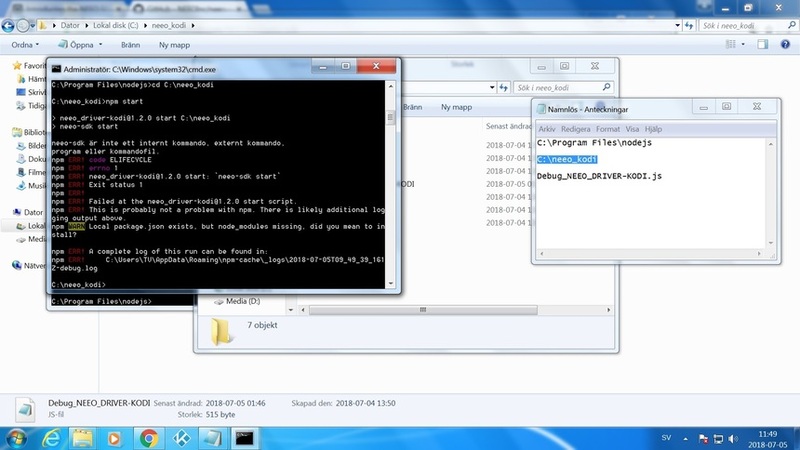 So what I will try later is to uninstall and remove the script from rc.local then reboot before a fresh install. Will let you know if that does it. Guys, I don't know what's happened but I deleted twice and reinstalled the driver but remote doesn't connect even though the settings happen to to well in BRAIN. Anyone got this working on linux? Christian Ek I just installed it on my pi. Just issued npm install and then npm start and all just works. Be sure avahi is running and node is installed. Niels de Klerk I can now confirm that it's working and I also removed the CEC module because they can't play ball with the driver. Niels de Klerk I absolute love this integration. It is working now like it should with such a Remote. Also THe update Library and the Start and Stop of Movies and TV shows, fast and enjoyable way of using KODI with NEEO! During my usage, i don't found any Issues, but if so i will inform about it. Markus Mahr i really appreciate your feedback, thanks. Niels de Klerk Allwayshappy to do. Also i love to see what is allready possible with the "limited" amount of the SDK and this works so well. Short Question: Did you specify the dimensions of the Pictures inside the Shortcut Widget or is this set by NEEO default? I think the Big one is one line to high, so the lable and the controls are not on the same Page, but this is only a cosmetic issue. Markus Mahr I have no control over that I’m afraid. But to keep with the trend I ordered one of these : LG UBK80 4K Ultra HD HDR Blu-ray / DVD / CD Player with High Resolution to be used for playing the physical discs and the lot! Emmanuel Serebe I think the best 4k Streaming Box is the ShieldTV from nvidia. Sadly they removed the IR Receiver in the newer model. But it is capable of everything needed and is based on AndroidTV (yeah, thats the only issue when it comes to customisation) but if you like to have Netflix, Amazon Video, Youtube and KODI this box installs all of them as plain Apps and directly make use of the latest kodi without need to wait until LibeElec or OSMC or so will implement the new KODI (yeah, they are fast, but need a few days to implement and test the changes made by KODI) and with Shield you can directly install the released version. Emmanuel Serebe the quality of HDMI cables do matter. If CEC doesn’t work then it’s often caused by the interference on the cable. A HDbaseT solution is ideal for long lengths. One that I use is the HDA MHUB. I'm not to fond of android boxes with kodi. Refresh rate switching is an issue on most if not all of them. Also 3D, HDAudio and HDR are things these boxes keep having issues with. It’s hard to get a do it all box. Best solution I know of is an Intel NUC, the picture quality of Intel filth video is just really good. I now choose to use the minix as the price is far better than a nuc. If you don’t need Dolby Vision then the minix U1 is the best choice. I choose the U9 because of Dolby Vision. A downside of the U9 is the AMlogic S912 chipset. Amlogic didn’t brought drivers for Linux thus generic drivers are used. This may result in slower UI performance but to be honest I haven’t noticed that at all. Also this box has its limitations, like all others. But support seems to be really good. Niels de Klerk I have an Nvidia Shield, quite happy with it for over a few years now. Frederik Vancoillie Whatever solution you chose, being happy with it is the only result that really counts. Niels de Klerk Is this a fault from the readout of the Kodi DB or is it due to handling of your Code? I mean the Marvel Readout displayed in the List. Markus Mahr i honestly don’t know, don’t do anything special with names but i will look into it. 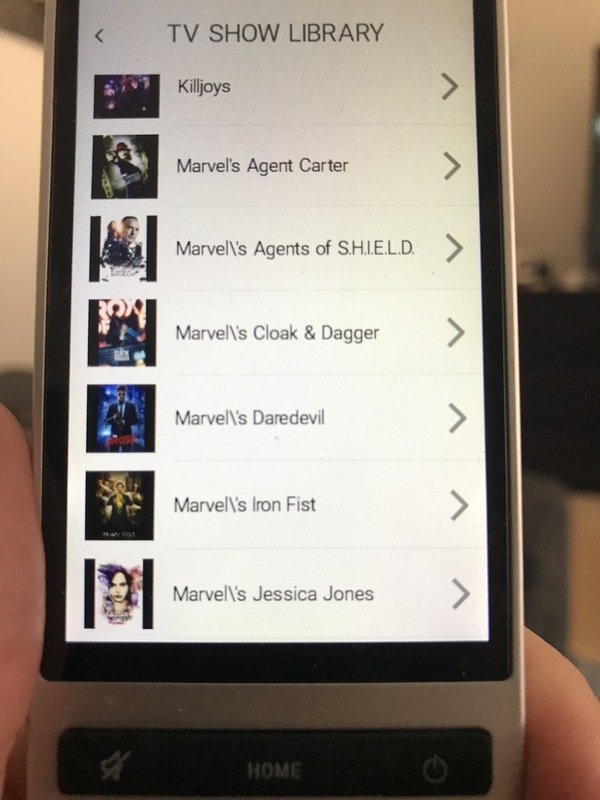 Markus Mahr I have all the same Marvel series but the ' displays as should be on my remote. Frederik Vancoillie thanks for validating. Markus Mahr I’ve checked, it’s a TR2 bug. assasin’s creed shows the same \’ on the TR2 and normal on EUI. Niels de Klerk Thank you ever so much. Niels de Klerk If I may ask, how do you install this one? Looks like the link you posted is for Homey! Emmanuel Serebe lol thanks. I’ve changed the link. Open a list rescans for active kodi and reconnect, but if only the update button is pressed, then nothign happen until i do an list open (which checks if kodi is still reachable i guess). Can you let the driver check the same befor using any command? Markus Mahr How do you run the driver? Through the console or other? Markus Mahr is your kodi going Into standby? How do you get it out of standby when keeping the listview open? The TCP session should not disconnect. Markus Mahr just updated with version 1.2.2. a connection will be set up when posible. but for the browser this means you need to go back a step and redo the action you wanted. Niels de Klerk I only use your driver to access the listviews and the update button. Kodi control is done via the nvidia shield ir codes due to kodi installed at this box and not allways running, that's the reason I found the issue, also the reason why it is going to standby or sleep. But I don't find the issue the connection is closed between the driver and kodi. There are definitely no ip changes in my setup, and kodi is not ended the most time after usage, it only is send to suspend and the shield is going to sleep mode. Markus Mahr if it sleeps then there is no connection. Just add the power on from my driver (or other key) to your recipe. If you disable the Power OFF via the code base (// coment it out) neeo is not able to use the Power on in recipes. If i let the Power OFF in and use it via Shield Recipe and Kodi, Kodi gets forced end when switching off the shield recipe beside no power off is configured. first i thought it was a mistake, but prrove wrong. I disabled the Power Off Commands due to the fact, that when ending my Recipe Kodis was closed allways (happen without entry in the Power Off recipe). But when disable the Power Off commands only, NEEO is not able to use the Power ON code by itself. It seems NEEO is waiting for both Power Off and Power On or a Power Toggle function. If this really is happening as i think it is currently, this needs to be seen as a bug (at least from my side) and it is fully unrelated to your code, since when i don't disable the Power Off Commandy, i'm able to use the Power On functions (and Power Off). Markus Mahr ah i get it. NEEO keeps track of what device is turned on/off so i would expect the turn on button atleast works once. Isn’t that the case? Niels de Klerk No, it is not exposed as a button when only Power On is available. Only if both are there during setup / adding it is possible to use this button in an recipe, for shortcuts i will check tomorrow if there it is still available. Markus Mahr im not sure this is a bug then. A driver should have a power toggle or power on/off, but Lets see. Niels de Klerk Yeah, thats what i will do later the day. I see it as a bug, because if something is defined it should be accessible in all cases and not skipped because something else is not correctly. Don't know if this is only power related or happen by other Button Groupings as well, this needs to be checked when i find some time to do so. Badly this needs a bit of time, since you are not able to update the driver and need to readd everything over and over again. Hello. I'm sorry that I sunk down this thread with ignorance. But although I'm very helpful, I do not get the driver to work. Does this picture tell you something? Jacob Wiqvist I also get this when I try to start npm. 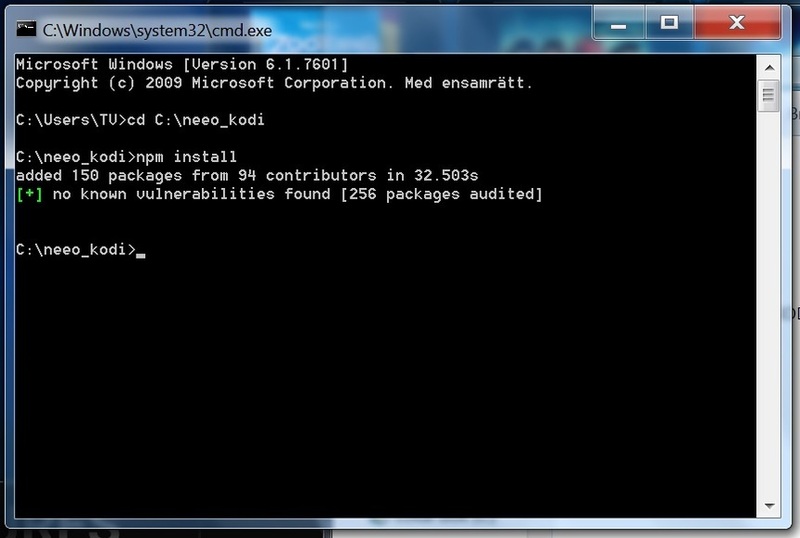 I editid the file Debug_NEEO_DRIVER_KODI.js with notes. Is that the wrong way to go? I changed the ip adress to my NEEO ip adress. Probobly super simpel erros I do but hope fully I will lern ho to install drivers in the process. Michael Kohler I did run that in the directory wher I installed, json: C:\Program Files\nodejs. See row 5 on the second picture? Michael Kohler I will do that and take pictures. Michael Kohler At least something hapend: But some error message in the end of the install. And som errors when I try to start the driver. Michael Kohler I got about 10 choises when installing but I just sticked with defult. Seems to be the same error messages even after git install. Allso not a windows user for a long time. But I wold not say that I am more skilled on Mac OS. Great to at lest get live help. Jacob Wiqvist I have not installed any NEEO SDK. Do I have to do that? Jacob Wiqvist I'll need to defer to somebody who knows Windows better than me then. Maybe Niels de Klerk could help here? I have not installed any NEEO SDK. Do I have to do that? Michael Kohler I can do it with mac to but I am not planing to run Kodi on a mac right now. Maybe on a mac mini later. But just for proof of concept. Michael Kohler I restarted the computer and now both the install and the start works. I don't get a screen yet abut what movie is playng but this is a start. Jacob Wiqvist Jacob Wiqvist Thanks for finding this one! 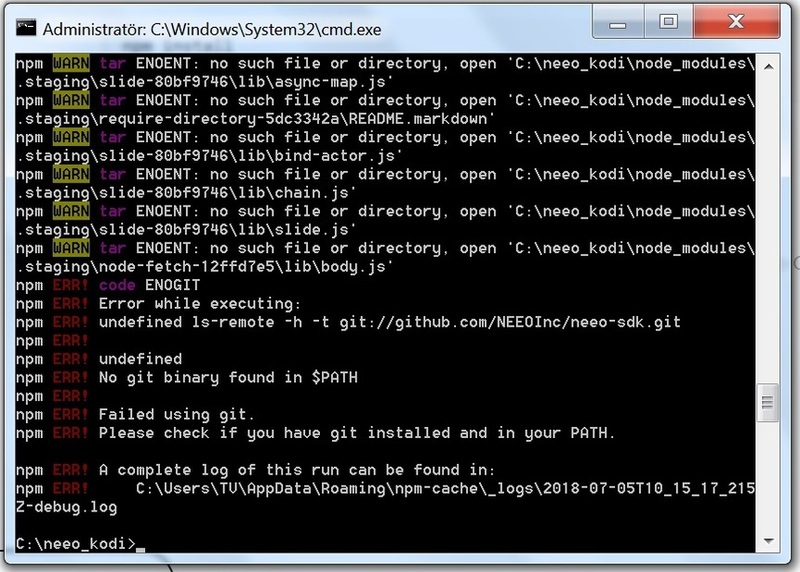 I should not have included the git link to the NEEO-SDK but the NPM package name..
Next update will include the correct link so that git isn't required anymore. Jacob Wiqvist Use this video to see how to use the driver. it's an older video so it doesn't show all features yet. Absolutely fantastic. The installation guide definitely needs some improvements. But now it works for me. I have some problems with fast forward and skip but that is probably not related to your driver, but Kodi. I manage to get right of the windows login screen and got Kodi start when windows starts. Still some problem with the start menu shows when Kodi is running. It hides with a press of the mouse. Hopefully get rite of that to. This driver gave me a lot of ides to AWR driver. What do you think of creating IP driver for most common AWRs, Ea. Maranz, Onkyo, Yammha, Pionner and so on. If I provide the graphics? I have some interesting ideas. I think a lot of people would be really happy if someone did that. I also have a bug to report but that maybe is NEEO problem or related to me doing something wrong. When I start the driver on NEEO remote or NEEEO app and return to the “home screen” of NEEO, there is no Recipe running. But maybe it is related to me changing the step “Kodi (HTPC) Power on” to “Movie and Media Power ON toggle” with is the IR command from NEEO bridge (MCE) to my (htpc antec fusion 430) HTPC Case? On thet note What HTPC do you use and how do you control it? Your video only helped when the driver was installed. You can follow the problems I was experiencing during the installation to know what could improve with the guide. Maybe I will try to make a new guide. If I have time. Many thanks for the fantastic driver. Jacob Wiqvist hello jacob il try to install the software on my synology and i have the same error message as you on your screenshot. . how did you resolved it? Sory to say I did not resolve it. I am patiently waiting for NEEO to make nativ support for third party “drivers”. When they fix this I will try again. Good luck and hope you resolve your issues! (I expect your response will be faster). I am shamelessly thieving your hard work to write a driver for Plex. Actually a few hours later I am already able to authenticate with plex.tv ; get a list of local servers and connect to them. Your code is super easy to follow (at least for me) - so thanks for that ! I've never used Kodi (plex guy here - each to their own!) - so forgive me if my question is dumb. With Plex I need to do two bits of device discovery. 1) The server(s) - which is fine and I have working. The second is the 'client' that you actually want to play out the content on. So ideally (at least it seems like this to me) - I would have two enable discovery calls. Except Neeo don't support that. How did you get around this with your Kodi driver? it looks like every Kodi server is also a client - is that right? David Hall also check the included movie 2 post before this one, there you can see the discovery working. I am shamelessly thieving your hard work to write a driver for Plex. 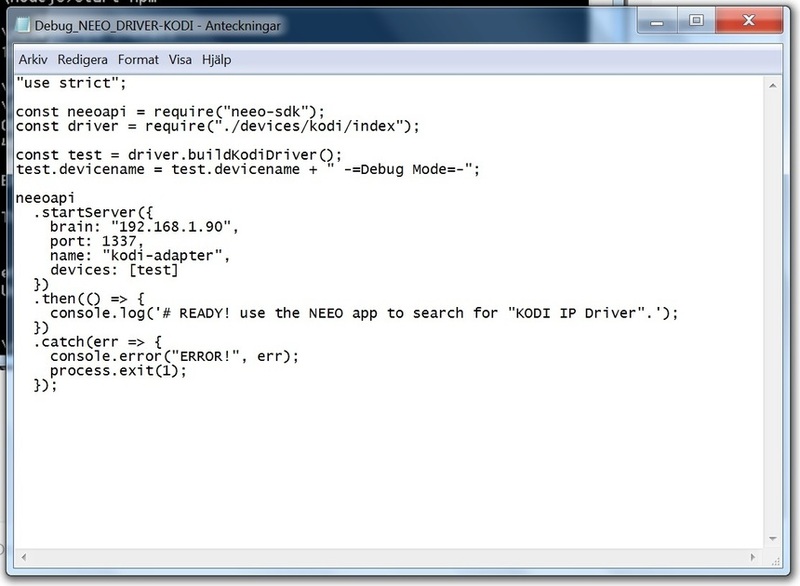 NEEO does supports discovery, I'm using that in my kodi driver. I return a new promise with timeout of 3 Seconds. In that time I start the discovery and respond the devices that I found within that time. you need to have a unique ID, I chose to use the mac address of a kodi instance. Niels de Klerk Thank you for replying - I wasn't particularly clear in my question. What I mean is that I need to do discovery twice (or thought I would). 2) Query that particular server for devices connected to it and allow the user to select. For the moment I'm solving it by doing 1) in the background, then querying each server for it's connected clients; and simply displaying that list in the Neeo discovery. This may actually be a better way than allowing the user to vary 2 - which is what I'd planned. 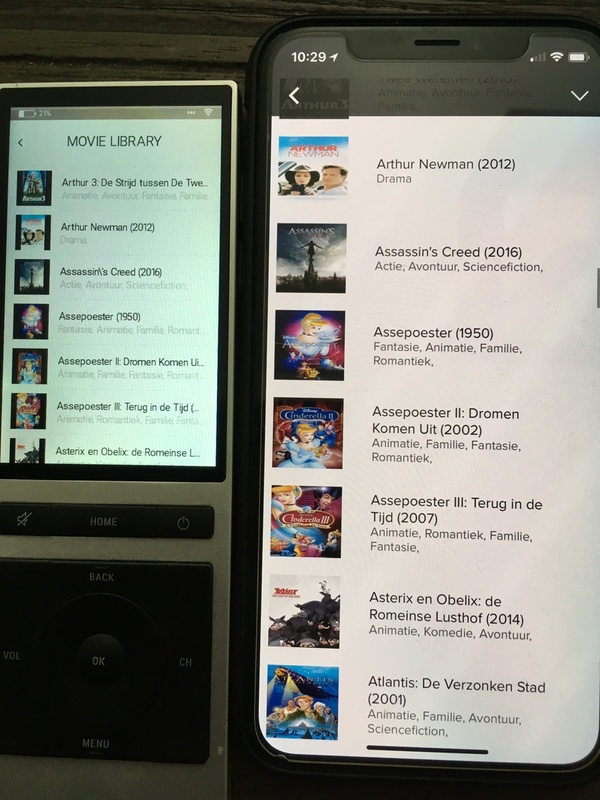 I guess you would just create multiple devices on your Neeo this was to manage multiple plex client instances. David Hall can't you let the user to select the client while adding the driver. This is what you are controlling so would make most sense to me. In list items you can present the first choice to select a server. or even make a separate server selection list feature. Niels de Klerk All of your response are very helpful - thank you very much. I am doing what you propose (client 1 on server1) - it's a bit of a pain since I guess for most people most clients will be on most servers but hey ho. The neat thing about that approach is that if I want to control two clients I just add two devices to Neeo - which is probably the best option from a UI perspective. David Hall also feel free to use GitHub to ask questions to the NEEO devs. 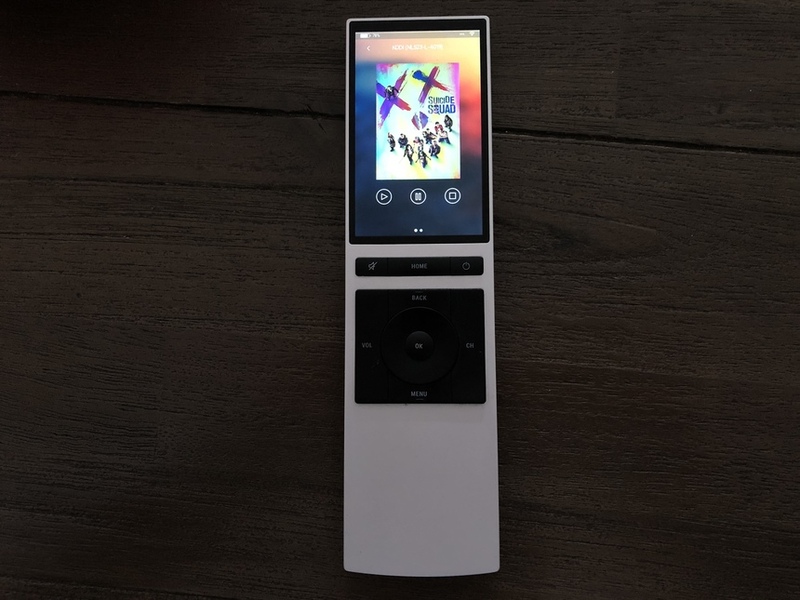 (@neeo-SDK) This way you will get an answer that is closest to the NEEO eco system in regards to a unified way of UI presentation to the user. i have made quite some rigorous changes along the way, coding my Kodi driver. And I’m probably need to do some more next time I have some coding time. So I would suggest just to start building the features you want to offer. If you later decide that another solution would be better than just do so. Absolutely fantastic. The installation guide definitely needs some improvements. But now it works for me. I only document the absolute minimum. reason is that every system is different, its more visible where users are having issues to run drivers. I manage to get right of the windows login screen and got Kodi start when windows starts. Still some problem with the start menu shows when Kodi is running. This is possibly due to a kodi setting, check the "Windowed fullscreen" option, settings -> display. set the option Off. and it will not happen. This is most probably due to your recipe, this must contain Power On and Power Off otherwise it won't show as active. I just switched to a Minix neo u9-h running LibreElec (Linux with kodi) and am using my own driver. The driver is running on a raspberry pi. I used to use a Intel NUC 6. Perfect picture quality. but doesn't support HEVC and 10bit Video. so I gone to minix as I unfortunately don't have a unlimited budget to buy another NUC.